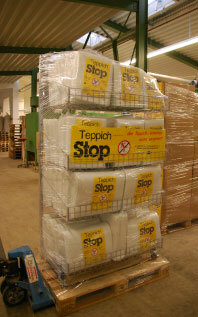 If you want to increase sales of rug antislip mats, use our rollable sales stands in differnet sizes. They guarantee an optimal presentation of your antislip mats at the point of sale. The advertising space on top may be designed with your own individualised preferences. Ordering a certain quantity of packages, our displays are available for free. Create the packaging in your individual corporate design. This will be printed by us also free of charge. Individual Dimensions: You need individual measurments for your rug antislip mats? Please ask us – we will try to satisfy your specific demands. 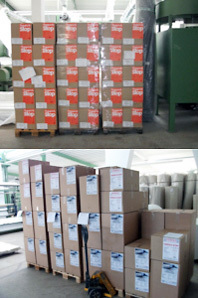 We supply highest quality, quickly and reliable. We provide you with a best fitting and rollable sales stand made of painted steel wire on a loan basis so you do not have to invest into one. 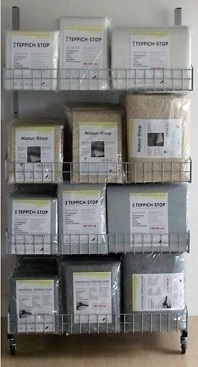 The tailor-made sizes make it easy to fill and empty the rug-stop mats for your clients and yourself. Demanding a lager quantity the separate billboard on top of the stand can be prepared according to your design. Beyond that togetherwith you we develop a presentation- and packaging-system fitting to your style-guides. Packaging presets and dimensions can be realised. They can be applied at the sales stands. Stand in various dimensions are deliverable. 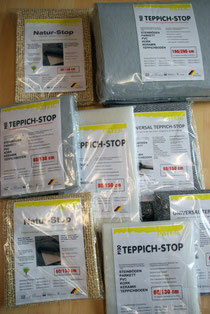 On request wie deliver Rug-Stop Packages with antislip mats with indivial designed flyers. The prints may contain logos, prices, EAN-codes, special dimensions. Please note a reference and contact-person in case of necessary further information. Not only the dimensions of the antislip mats can be cut as required, also the packaging-sizes can be adapted according to your demands. 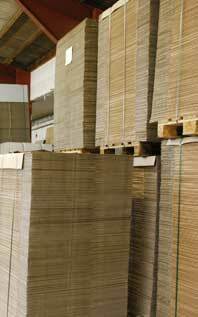 All packaging units ar optimised for delivery and storage on Europallets. We take into account special heights of packaging for high-bay storage. We do everything, to realise your wishes in afast and unbureaucratic way. Please ask us, we will be glad to help you. We deliver as quick as possible directly after your order. Our internal production is optimised to reach a short-term delivery scedule. In the range of 5-10 days your order normally is ready to dispatch. Our logistic partners are carefully selected and guarantee a maximum of reliability. Orders can be sent directly to differnt stores or distribution center.